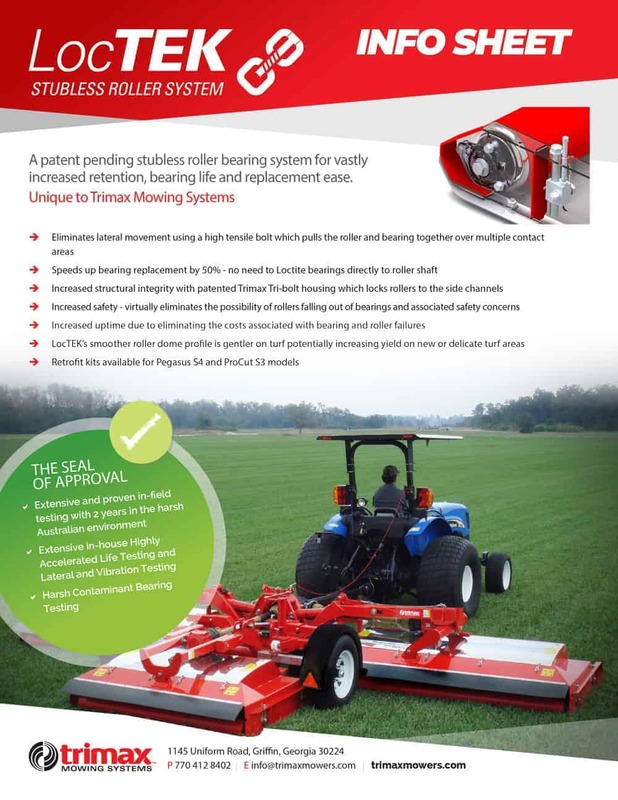 At the Turfgrass Producers International Conference in February Trimax Mowing Systems announced that it’s saying goodbye to high maintenance stub and roller retention systems and introduced LocTEK – A patent pending stubless roller system unique to Trimax. 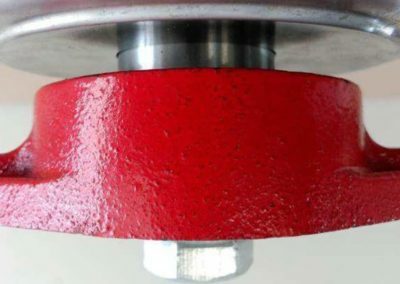 #1 Vastly Increased Retention and Strength: Traditional stubbed roller systems secure roller stubs directly into bearings using grub screws or collar locks, but this method has long been subject to stub and bearing wear from regular horizontal loading, and as a result – roller retention issues. Traditional roller stubs often need to be re-machined or replaced to correct any wear issues effecting roller retention and alignment. LocTEK does away with these issues completely by using a high tensile threaded bolt, inserted through a protective zinc coated sleeve which locks the roller, bearing and side channels together. 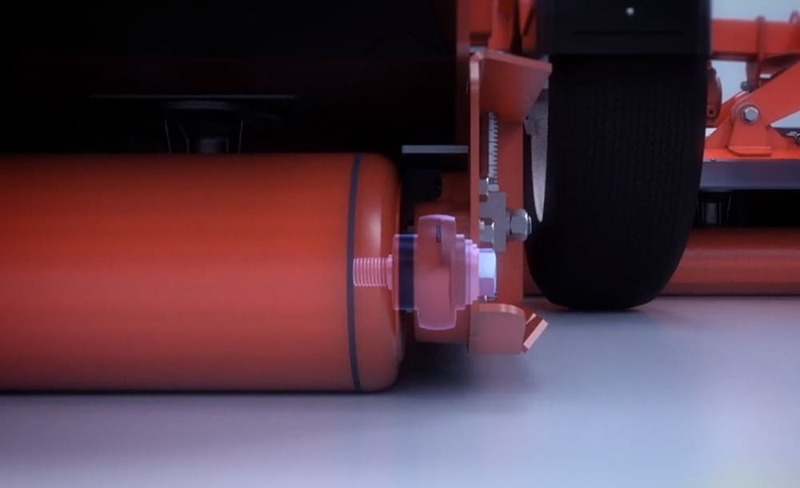 This simple yet innovative bolt system is not only free from wear but also provides a much stronger retention option and ensures ongoing and accurate roller alignment. 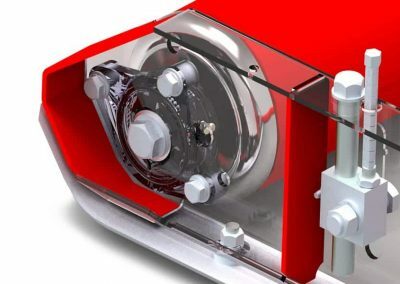 The new LocTEK system also includes increased strength tri-bolt bearing housings, which bolt to the side channels and have been upgraded from a two-bolt system. 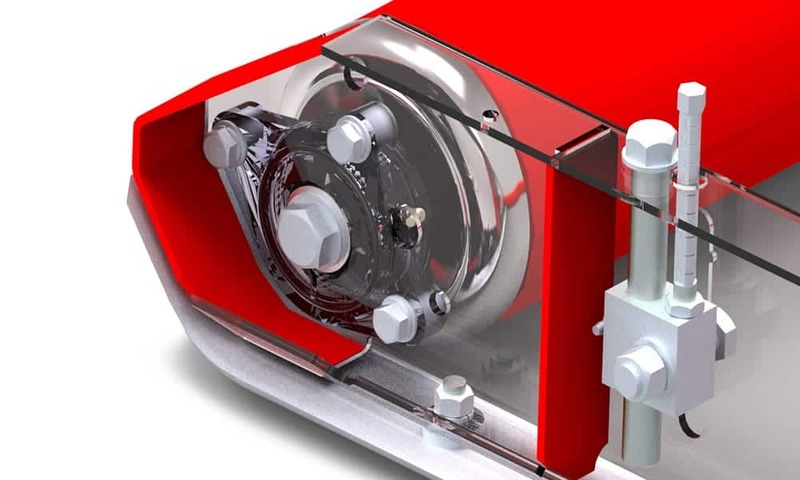 #2 Increased Replacement Ease and Lower Maintenance Costs: LocTEK vastly reduces replacement time. Previously, removing an adhesive-fixed stub from a bearing could often be challenging and time consuming. LocTEK doesn’t require any specialist tools and can be replaced in as little as 15 minutes. 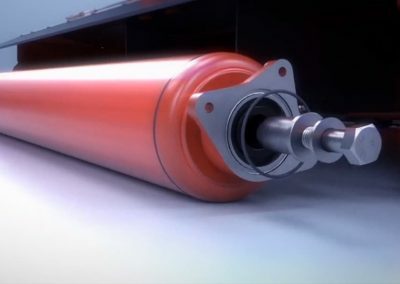 The bolt can easily be removed from the roller and bearing system with an impact gun and the zinc sleeve, assembled with anti-seize, can be easily removed from the bearing. 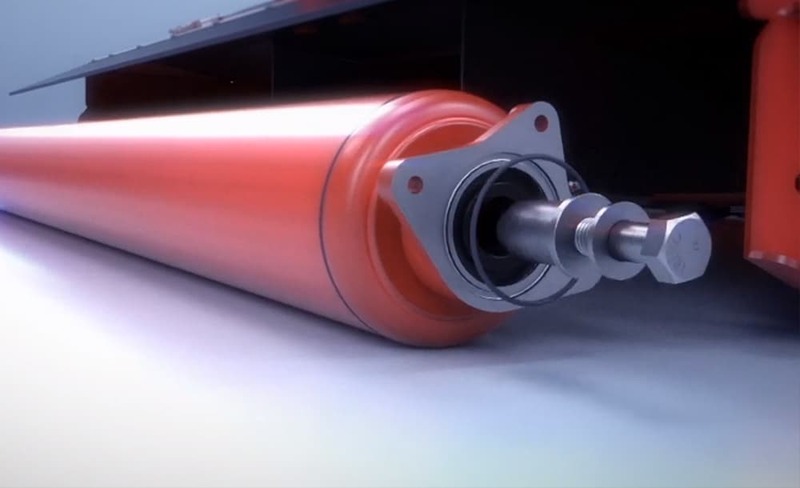 Where some traditional systems require re-machining of the roller stub, or if the roller stub is too far gone – the purchase of a full new roller, LocTEK is comprised of independent parts that can be purchased separately. This means just the desired part can be acquired, providing significant cost savings. #3 Increased Bearing Life: One of the most common causes of bearing failure is stub misalignment. Misalignment in roller stubs can cause the outer race of the bearing to oscillate inside the housing, wearing out bearings and the bearing housing prematurely and increasing replacement frequency. Having fully eliminated misalignment LocTEK bearings suffer less stress and last significantly longer. LocTEK also uses market proven, high quality bearings which have been subject to years of Trimax in-field testing. 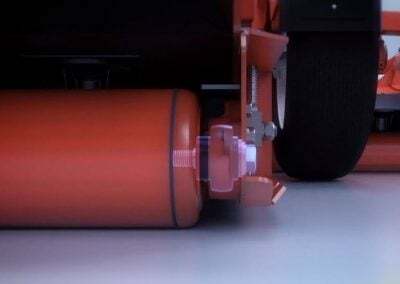 To further aide bearing longevity LocTEK provides new added protection against water damage through a clever convex ridge on the end of LocTEK rollers. The roller ridge prohibits wafter running down a vertical roller in transport mode and reaching or pooling around the bearing. 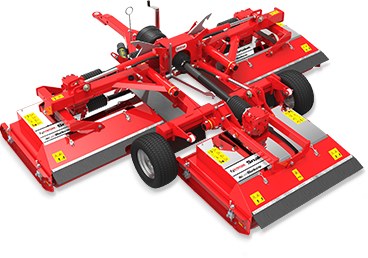 LocTEK is now being produced on all Trimax Pegasus and Procut S4 mowers can be purchased as a retrofit system specifically developed for conversions of stubbed bearing systems on selected mowers. 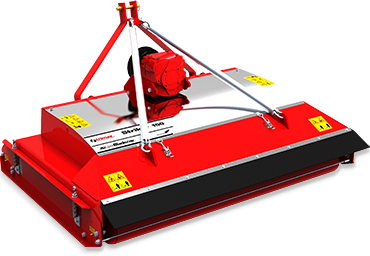 Keep your eyes peeled for the Trimax LocTEK video to be released shortly on our website and social media pages – in the meantime to learn more about LocTEK or any other Trimax mowing innovations contact our Georgia based sales team on 770 412 8402.